Upon being featured in Time Magazine’s ‘World’s Greatest Places’ list, Santani, Sri Lanka’s first purpose-built luxury wellness resort, yesterday announced plans to invest over $ 50 million to build three new properties locally and overseas. Santani, located in Kandy, was one of the only eight Asian properties featured on a list of 45 properties and it is also the first time a Sri Lankan entity has made it to any of Time Magazine’s acclaimed lists. Pointing out that Santani has received unprecedented international recognition since opening a year and a half ago, Founder and CEO Vickum Nawagamuwage said that they were honoured to be featured among the world’s top hospitality brands. “This signifies how Santani has used its conceptual positioning to bring significant exposure to the country. 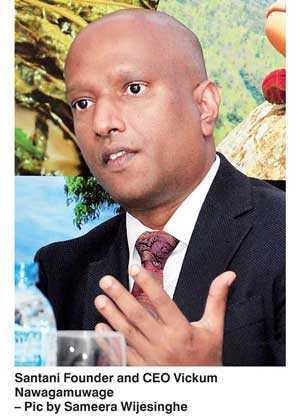 It is not just an achievement for Santani, but an accomplishment for the country,” he told journalists in Colombo at a media briefing organised by the Sri Lanka Tourism Promotion Bureau (SLTPB). Nawagamuwage stated that they were looking at an over $ 50 million raise that would go into the three hotels next year. “We are looking at areas in Anuradhapura and Wilpattu which are underserved at present as well as the Eastern Province for expansions. Our focus all this time was to create a strong brand and we think it is the opportune time for us to look at opportunities overseas. We are looking at the Asian region, but options are still open as it is too early to comment,” he added. He expressed confidence that these plans would come into place in the next six to eight months, adding that they were also planning on expanding the property in Kandy. “We are planning to develop villas where we are offering an opportunity for the public to partner with our success. These will be operated under the Santani brand, but the investors can own the villa. This will be launched next month,” he said. Nawagamuwage also outlined that listing Santani within the next three to five years is on the cards. He pointed out that wellness tourism was the fastest growing tourism segment in the world, where it has grown at about 14% year-on-year, whereas industry growth is at around 6%. Selling at around $ 450 per night and maintaining an occupancy rate of 70% year around, he said the company had managed to cover the return on investment (ROI) in the first year itself, which is not usually the case in the hospitality industry. Emphasising that Sri Lanka as a country had not really explored its true potential, he said the country needed to create multiple products for multiple markets. “We have some of the best wildlife outside Africa. We have scenic beauty, culture, heritage and beaches. We have much better products than most countries in the region. We should be a 10 million destination right now. It is not just about putting the numbers but creating a unique product. We need to understand what kind of products are needed in cultural triangles, hill country, beaches, wildlife and who are the customers we want to target. Then create a message and channels of taking that message to each of the markets. Then we can reach the 10 million arrivals very easily,” Nawagamuwage added.